Go Red for Women Celebrates 15 Years - Thank You! 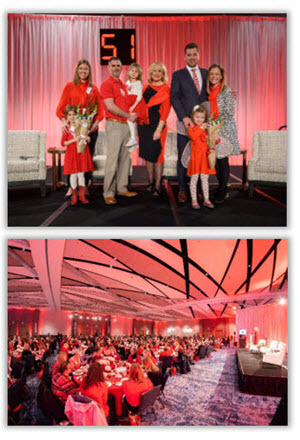 On February 15th, we celebrated the momentous 15th anniversary of the Go Red for Women movement here in Cleveland. Presented locally by University Hospitals Harrington Heart & Vascular Institute, the Go Red for Women Experience raised more than $600,000 and engaged over 700 guests at the event, who were eager to advance women’s heart and brain health through education, awareness, collaboration and research. This year’s event was championed by one of the American Heart Association’s Cleveland’s board members, Patricia Horvath of UnitedHealthcare, and held at a new location, the Hilton Cleveland Downtown! Thank you to Patricia for her leadership and passion spearheading this campaign! Thank you also to the individuals who were part of the Executive Leadership Team that brought the event to life. Highlights of the day included “Girls Just Wanna Have Fun” Hands-Only CPR Training, breakout sessions educating guests on mindfulness and a healthy Mediterranean diet, an inspirational first-responder video gallery, and an educational and heartwarming program featuring a panel of renowned cardiologists from University Hospitals Harrington Heart & Vascular Institute and an inspiring video featuring local survivors Nick Pfahl and Elizabeth Wallace. The most exciting announcement of the day was when Dr. Marco Costa, President of University Hospitals Harrington Heart & Vascular Institute, made the commitment that they have renewed their presenting level sponsorship for the next three years! We cannot wait to see the impact that this will help us to make! Women are leaning into the idea that when we take a stand, commit, and work together, real change is possible. The time is now. You are the answer. Join us as we build a healthier Cleveland. Life is Why. You are How. ​ Time is Why.